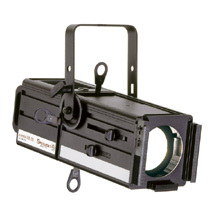 The Profile spotlight gives accurate control of beam size, shape and quality. The lamp and reflector are stationary: movement of the lens adjusts the quality of the beam edge to the required degree of hardness and softness. Size and shape of the beam are controlled at the optical center of the system where there is usually a set of four-sided shutters to provide any desired shape size with straight edges. The optical system allows the projection of slides or Gobos.